Cherry Cheesecake Rhododendron-Hybrid Rhododendrons- Rainer Rhododendrons Nursery, Washington. 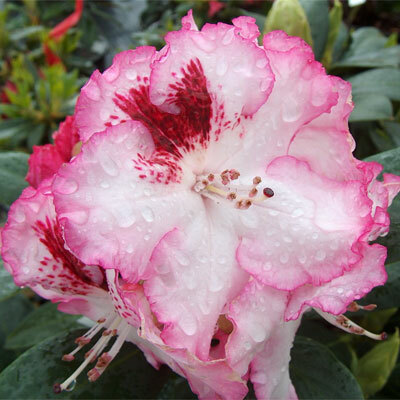 Cherry Cheesecake is an improved form of Hachmann's Charmant Rhdododendron. Flowers are white with red edges and a red blotch. Large lush mounding foliage on this shrub.